Bangladesh and Estonia today discussed strengthening cooperation between the two countries in the ICT sector. 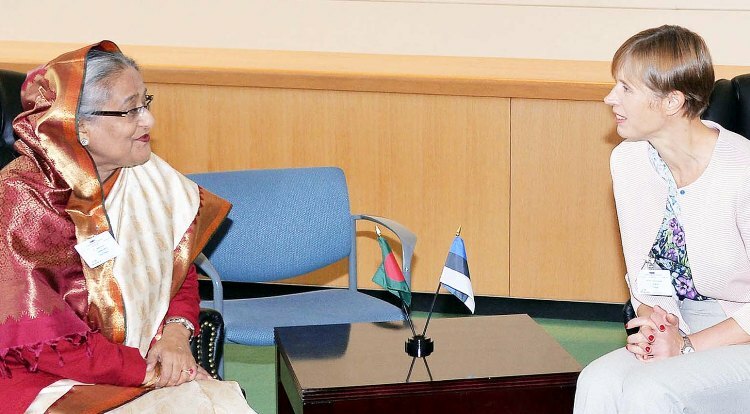 The discussion was held during a bilateral meeting between Estonian President Kersti Kaljulaid and Bangladesh Prime Minister Sheikh Hasina at UN Headquarters on the sidelines of the UN General Assembly meeting, BSS reports. During a briefing, Bangladesh Permanent Representative to UN Masud Bin Momen said President Kersti apprised the prime minister of her county's digital progress over the last few years. Prime Minister Sheikh Hasina also highlighted Bangladesh's recent success in the ICT sector. Both the leaders were keen to share their experience with each other and strengthen cooperation in the ICT sector to tap the potentials of the sector. Foreign Secretary M Shahidul Haque and PM's Press Secretary Ihsanul Karim were present. The leaders also discussed other prospective areas of cooperation, the foreign secretary said. In the afternoon, the prime minister held a meeting with Queen Maxima of the Netherlands, also UN special envoy on financing. The foreign secretary said Queen Maxima and Bangladesh prime minister discussed the Rohingya issues. The Netherlands Queen highly praised Bangladesh for its role in dealing with the Rohingya issues. PM's Advisor on ICT Affairs Sajeeb Ahmed Wajed was present on the occasion. Director General of the International Organization for Migration (IOM) William Lacy Swing made a call on Prime Minister Sheikh Hasina at her hotel suite. The DG informed the prime minister of the relief operation activities of IOM for Rohingyas who fled to Bangladesh being subject to prosecution in Myanmar. William Lacy informed the prime minister that he will visit Bangladesh on October 5-6. The IOM is leading the relief operational activities of various UN agencies in Bangladesh.